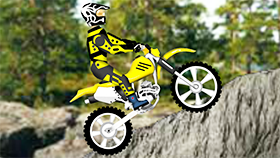 Dirt Bike 3 is the third part of this interesting driving series. This game has unique graphics, suitable for all ages, especially children and families. You can experience this game on your browser because it is a flash game. 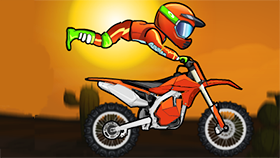 In this game you control a motorbike and you will ride in a city. 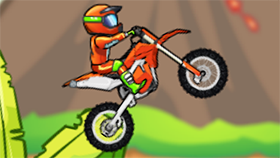 Your task is to pass the obstacles in the map and run to the destination safely. This game has many levels, each level is a challenge for you. In each level, you will face complex terrain. You must drive your motorcycle carefully because trucks, cars and other vehicles on the road will hinder you. When you start the game, time will run. The faster you complete the level, the more points you have. At the bottom of the game screen is the distance bar. You can look at it to know the distance between you and the destination location. You have to balance every time you drive on obstacles. Note: If you fall, you will lose and the game will end. Good luck and have fun! 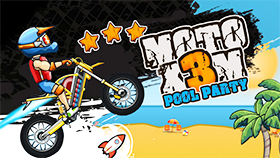 If you like this game, you can also play other games with the same game play such as Snow Fall Race, Moto X3M 2… or you can play another season of this game, namely Dirt Bike 2. Use space to play again.